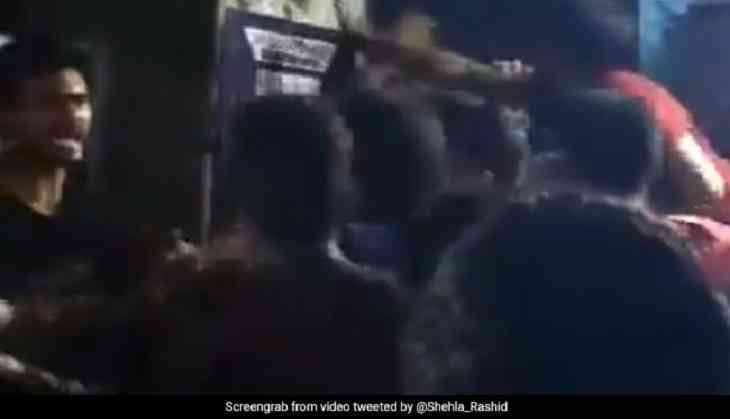 Hours after Left organizations registered victory in students’ union election at Jawaharlal Nehru University, a clash between the AISA (All India Students Association) and ABVP (Akhil Bharatiya Vidyarthi Parishad) erupted at the campus. The united front of Left student groups on Sunday defeated RSS-affiliated ABVP on the four central panel posts of the union by considerable margins. Newly elected JNUSU president N Sai Balaji alleged that he was beaten up by ABVP members on Monday. According to Balaji, ABVP members were thrashing an AISA member and the JNUSU members along with its president intervened, they were assaulted too. They were also attacked by ABVP members when a Police Control Room (PCR) vehicle was taking them away from the campus. On the other hand, the ABVP also claimed that their members were beaten up by AISA activists. Both organizations –ABVP and AISA- have lodged complaints at the Vasant Kunj police station. Talking about the incident, Deputy Commissioner of Police (Southwest) Devender Arya said “The PCR got calls about a scuffle between students in JNU around 3 am. Subsequently, we had a discussion with university authorities, students and professors. Complaints have been received in Vasant Kunj (North) police station. Legal action is being taken on merit. The situation is under control and normal. Police arrangements are in place”.